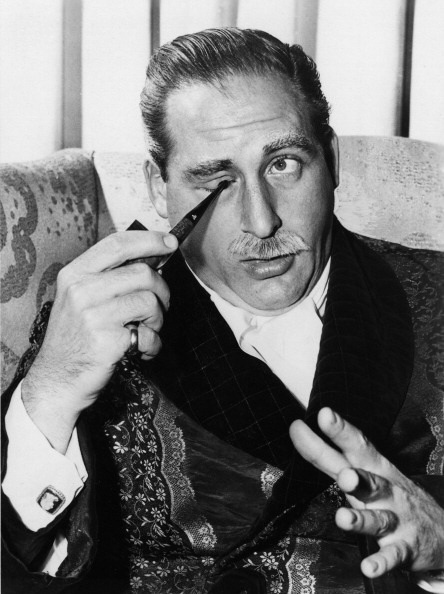 The only surviving photograph of Uncle Oswald. He was later to be savaged by stoats. One of the most famous members of the Bilston clan, Oswald is now perhaps remembered more for his unfortunate end than for the contribution he made to academic life throughout the twentieth century. A scholar, a thinker, a poet, a dreamer, Oswald was, in many respects, the most eminent Bilston of them all. It’s a construction that bears all the hallmarks of Oswald’s later, more complex pieces; the short, insistent phrasings, the alliterations and repetitions, the rhythmic cadences, all feeding the fury that lies within. It’s a fury that seems somehow infinite in its duration, as if Oswald is saying that in the beginning is the end and in the end is the beginning. To this day, scholars have disputed the poem’s provenance; some claiming that it represents Oswald’s first howl of protest against the horrors of the Great War which was just a few short years ahead, whilst others maintain Oswald was merely hungry for more milk from wet nurse, Nanny Newbold. By the age of five, Oswald had devoured the complete works of Dickens, Eliot, Trollope, Zola and Vialli. Later, having learnt to read, it was something he came to regret bitterly. It wasn’t until ten years later when his father, Edmond Bilston, returned home with the spoils from the infamous Stadhampton Public Library Robbery of 1926 that he was able to familiarise himself with the literary greats. But whatever archetypal agonies of adolescence Oswald may have gone through, he was not an unhappy child, and, thus far, there was little intimation of the stoats which would blight his later years and be the cause of his hastened demise. With nothing but a dose of clap. Or maybe just the one. Although intellectually he was making huge strides, his progress was to become almost completely derailed in his final year at Uxbridge as he developed an addiction that almost destroyed him and one which he was to destined fight for the rest of his life: queueing. Queueing, for Oswald, was something that he came to see as quintessentially English; as English, say, as cucumber sandwiches on a summer’s day or a pleasantly unexpected conversation about Sir Jack Hobbs’ batting form with a travelling vacuum cleaner salesman on a doorstep in Croydon. Like many addicts before him and since, he had stumbled into it inadvertently. One morning in February 1931 he stooped to tie an unruly shoelace outside the doorway of a haberdashery shop on Uxbridge High Street. Upon righting himself, he glanced behind to see two women standing in line behind him, waiting for the shop to open. He stood there for some more minutes and was interested to note the arrival of two more people, again standing patiently in line. Standing there, he felt a reassuring sense of order and, with it, an inner serenity the like of which he had never experienced before. He returned to the haberdashers the next day. Over the coming weeks, Oswald found himself joining queues whenever and wherever they presented themselves: at the post-office, the butchers, the betting shop, the launderette, the Women’s Institute. He began to form one-man queues in the middle of the university library and would stand patiently for hours waiting until the feeling subsided. One estimate has it that Oswald was spending 16 or 17 hours a day queueing during this period. His studies began to suffer as a result and it was no surprise when he received notification of his third-class degree. One hand upon your milk-white throat. There is little indication that Oswald knew at this time how important stoats were to become to him, and how unsubmissive they really were. Oswald was later to refer to the interwar period as “the lost years”; not without truth, as he mislaid both 1933 and 1935 and wasn’t to discover them again until after Attlee came to power in 1945. In many ways, though, this period was to lay the foundations of his future acclaim and many of the famous poems written in the final years of his life drew heavily on his experiences during this time. I am in a dither. Oswald would zither with zest and zeal but suffered from a tendency to get carried away with his own strumming, frequently breaking strings and, on occasion, smashing the entire frame as his performance reached its frenzied climax. Twice a week, he would make the fifty-mile round trip to Purlows the Zithermakers to order a replacement. Oswald looks on as Peter Purlow assesses the zither damage. The necessity to finance his zithering led him to take up a position at Henry Finch & Co, a renowned outfitters specialising in tastefully selected attire for the country gentleman. His first six months were spent predominantly working in the socks and stockings department but it was not a happy experience. Oswald showed little natural aptitude for the role and once even made the mistake of offering a pair of Hedley Argyle partridge-hunting socks to a client about to embark upon a pheasant shoot. The embarrassment surrounding the hapless Oswald was palpable and hung in the air for several weeks. It was clear that Oswald was unfit for the world of outfitting and he then embarked upon a series of positions over the following three years, none of which he remained in for more than a couple of months: hospital porter, sewing machine salesman, chicken sexer, human cannonball, scullery maid, whittler. And so it was, in October 1937, that he was to find himself walking through the door of J.D. Batterby’s, the academic and scientific publishers, with low expectations of retaining his new position even until Christmas. If he had been told that he would spend the rest of his working life there, he would have been astonished. To drive the vermin off? For the time being, though, it was not to be the stoat but the vermin of Nazism that was to emerge as the biggest threat and the country drifted slowly to war. J.D. Batterby was just twenty-one when he formed the publishing company that was to make both his fortune and his reputation. The natural charisma and zeal of Batterby was such that very quickly he was able to convince many of the leading intellectuals of the day to write books for him; highlights of these early years included Sir Grenville Proom’s Origins of the Specious, Edmond Pennington’s History of Belgium Shipping 1782 – 1803 and Yevgeny Denisov’s The Empty Cutlery Drawer and other Philosophical Re-Imaginings. Although he’d retired by the time of Oswald’s arrival, Batterby’s presence still clung to the Clerkenwell offices like the scent of a beautiful actress lingers in a provincial theatre dressing-room after the final curtain has come down and audience, cast and crew long since departed. Oswald was flung into an office alive with the fervid fever of earnest academic debate and he was soon making his mark as the dynamic commissioning editor for Batterby’s history list. He quickly built up the publishing programme in areas which he considered had previously been under-represented, particularly in the fields of Macedonian coinage and Guatemalan-Portuguese relations. He also began an ambitious reference project An Encyclopedia of Everything that has Ever Happened in History Ever. In this Oswald attempted to catalogue everything that had ever happened in history ever in order to create the definitive reference work for future generations of scholars and students alike on everything that had ever happened in history ever. It was a massive undertaking and by the time of Oswald’s death, 7,422 volumes had been published but coverage had still only reached as far as Charlemagne’s twelfth birthday party (a somewhat dour affair enlivened only by his father, Pepin the Short, performing his wonderful impression of Great-Aunt Swanhild’s wolfhound, Toby). Six volumes alone had been devoted to Nero’s love of biscuits. Although work continues on the Encyclopedia by other members of the Bilston family, it seems unlikely that it will ever be finished. Of the world’s greatest nation. The other he left in the vestibule. But Himmler’s belong at a festivule. The savage imagery of the stoat had returned to Oswald’s writing again. But it was in the years immediately following the war that stoats began to take on a broader significance in Oswald’s life, and would lead to the gradual disintegration of his mental landscape. Postwar Britain was a time of austerity, rationing and rebuilding and, for Oswald, life was no different. The cost-cutting and penny-pinching had spread to J.D. Batterby’s and, for a while, Oswald found himself not just signing new titles for the history programme but writing, printing, marketing and selling them himself. It is estimated that in 1948, Oswald wrote ninety-three books on subjects as diverse as the statecraft of Vespasian, linguistic variations in Austro-Hungarian legal documents concerning primogeniture and the socio-historical importance of Berkhamstead’s liquorice industry. The combination of over-working and hallucinations was proving to be a dangerous one for Oswald and was to be further exacerbated in October 1950 when into this heady mix walked Agnes Warburton. 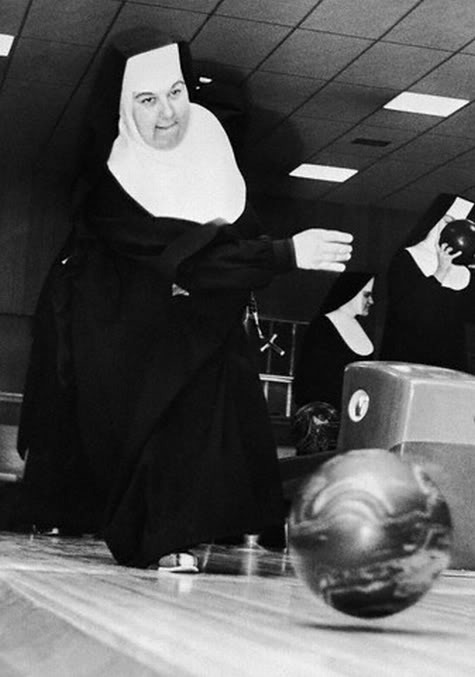 Agnes Warburton competing in the 1951 Nun Ten Pin Bowling contest. She finished ninth. The occasion of their first meeting was to become the stuff of legend. Oswald, walking home late one night from the office, found himself caught in a heavy downpour. Seeking respite from the rain, he ducked into the nearest doorway and found himself inside none other an establishment than Wimples, a nightclub typically frequented by nuns wanting to let their hair down after evening Vespers. Oswald had never fallen in love before but now he fell: deeply, desperately, despairingly. 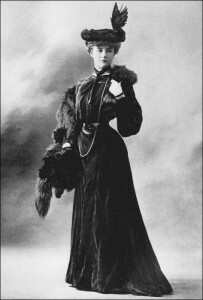 Daily visits to the convent followed, accompanied by entreaties for her to give up the whole nunning business in favour of a life with himself. I stroked your dainty dimple. *Not literally. If that had been literally, he would have most likely died. I wrote that bit just to spice things up somewhat as I felt that section needed a little more ‘pep’. That’s also why I decided to include the word ‘discombobulation’ later in the paragraph. 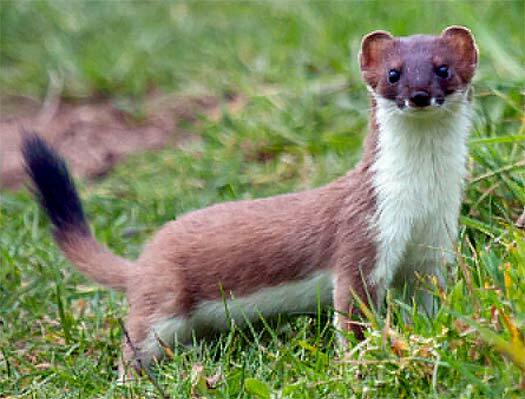 A picture of a stoat. Despite such a clarity of vision and purpose, membership of the Anti-Stoat League was slow to build. By November 1954, the League had attracted only three members: Oswald himself, his close friend Ginger Bentham and Mrs Glenda O’Hare, the one-legged haberdasher from the village. 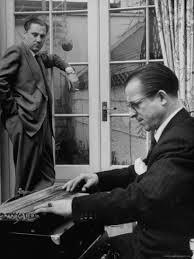 This piece is reflective of Oswald’s demeanour at this time: brooding, melancholic – and darkly prescient. It is not pleasant think of the sight that must have greeted Jacques Dubricki that day. Death by stoat is by no means a glamorous way to go, death by a thousand extremely irate stoats even less so. It took six whole weeks to clean the study; and, on occasion, bits of Oswald are still uncovered today. What is this world into which we are born? For far have we travelled from our first day’s dawn. And we are remembered but then soon forgot. *I really enjoyed writing that line. I only wish the rest of my narrative could have contained such wonderful phrasings.